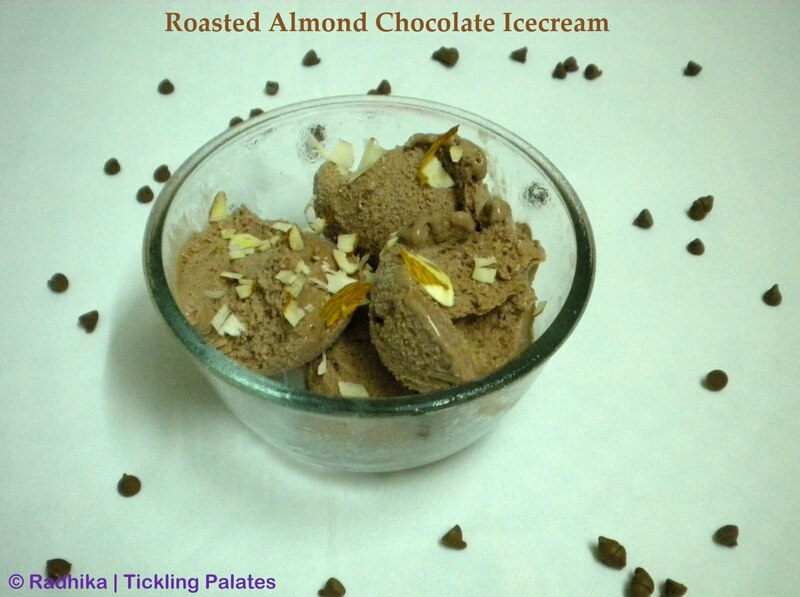 When I thought of celebrating my blog birthday and announced this event I really wanted to make this ice cream and post it as this happens to be family’s favorite. My kids also wished for the same, they knew that the blog did not have a single ice cream post and wanted me to post specially for this occasion. 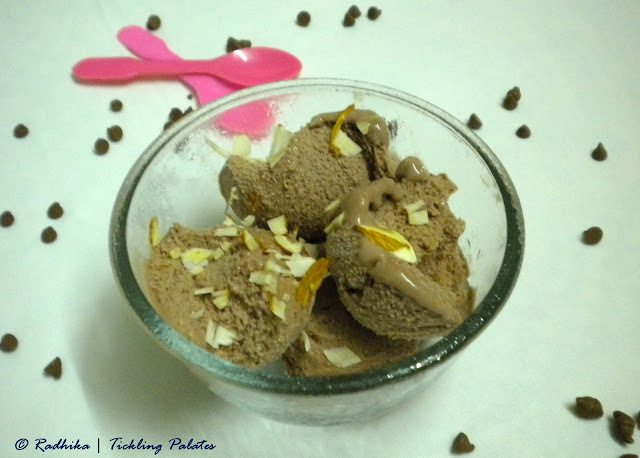 Though I had been making ice creams for several years now it was only during on special family celebrations and I had never managed to click a single snap after I started my blog as it disappears so fast after bringing it out of the refrigerator. As the kids wanted this to be posted so badly I forewarned them that there is to be no peeking inside the freezer. They agreed for all the conditions and showed so much restraint, that I was so amused. So this post is really dedicated to those lovely little brats who showed more understanding. Heat the milk in a pan. Add sugar little by little and let it dissolve completely. In a bowl take some hot milk and add gelatin. Beat with a spoon and let it dissolve. Add this to the boiling milk and mix it properly. Cook for 2-3 minutes while stirring. In a bowl take some hot milk and add the chocolate chunks and mix well and let it dissolve to a sauce consistency. You can also do this in microwave. In a bowl add corn flour and less than 1/4 cup of water and dissolve it without any lumps. Add this and the chocolate sauce little by little to the boiling milk. Make sure the flame is low. Let it cool completely. Beat well with a hand mixer or in a blender. Transfer this to an aluminium mould and shove it in the freezer to set. Roast the almond slivers in ghee and keep it ready. After 5 or 6 hours remove the mould and empty the formed chunks in a bowl. Pour the cream, vanilla and sweet almond essence and beat again with a mixer. Finally add the roasted almond slivers and mix. Transfer it again to the mould and let it set again. Ice cream is ready to be served after 3 – 4 hours of setting time. Garnish with more almond slivers before serving in individual serving bowls. Aluminium moulds work better for setting ice creams. 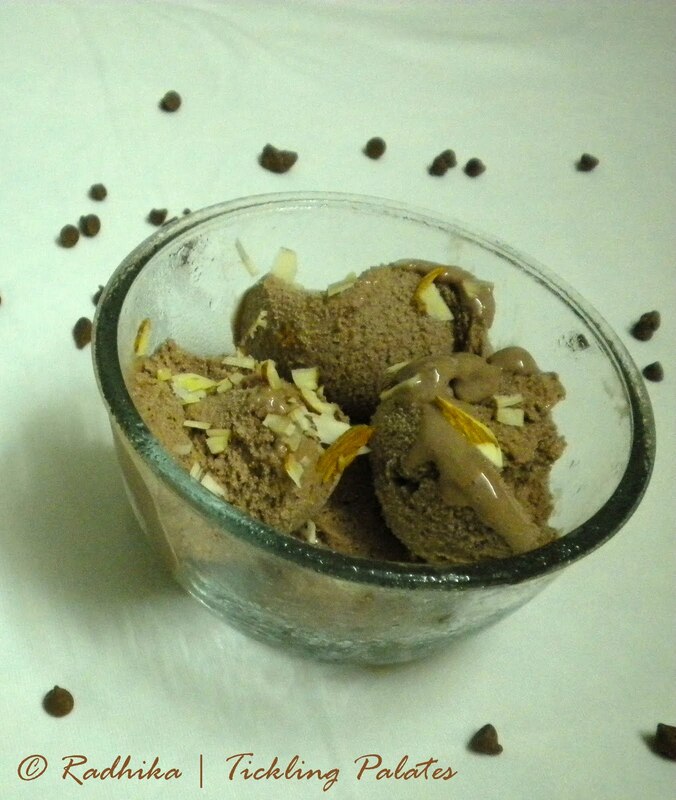 For the perfect scoop: Refrigerate the scoop and dip it in water before scooping the ice cream. Works best. You can also use cocoa powder instead of chocolate sauce. You can omit the almond essence and replace it with vanilla essence. Have you sent in your entries for FUN N SUN. If not then hurry, only 4 days left. Wow… so tempting…lovely and yummy.. Awesome ice cream. Looks fantastic. 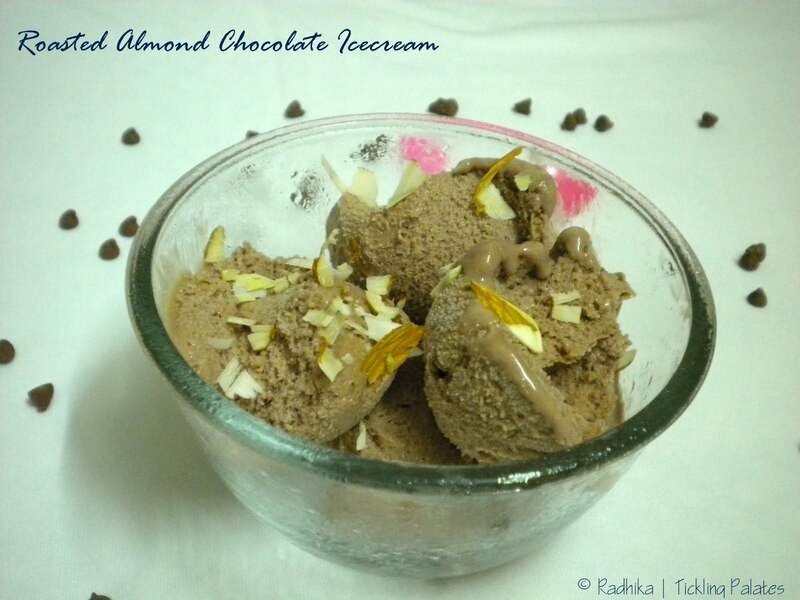 Thanks Radhika for such a delicious entry!! Drooling over it. It is looking so inviting. Congrats on your awards dear. Great looking ice cream. Excellent dessert. wow..that looks superb yummy !!! wow so wonderful and yummy ice cream !! Congrats! 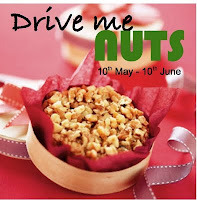 looks delish..very tempting..love to have it rite now! 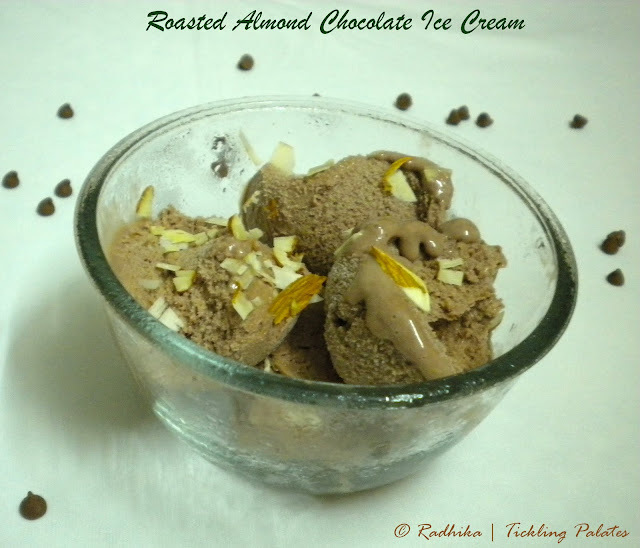 Excellent flavours in the ice cream…super to chill out in the summers. Chocolate icecream with roasted almonds looks absolutely irresistible,feel like finishing that bowl..
Wow .. so yummy. My kids would gobble it in no time. 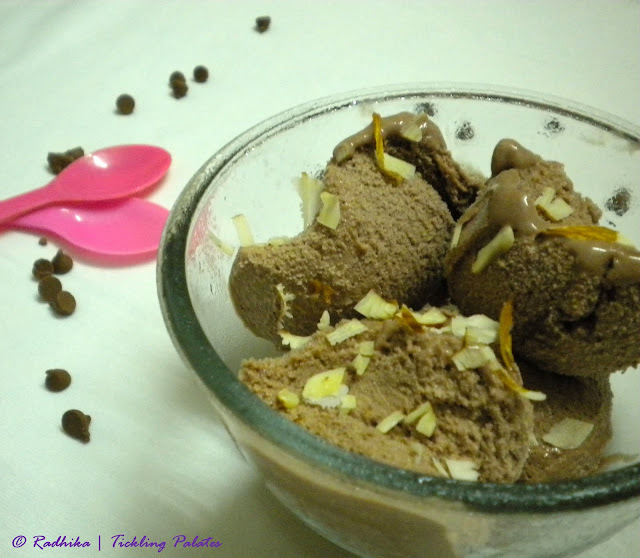 wonderful recipe..it looks so delicious..
all the ice creams in the blogosphere is tempting me to make some soon..looks awesome..
Yummy…. 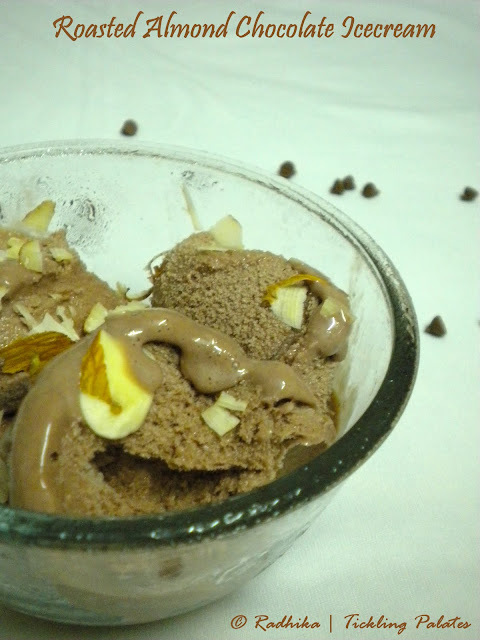 I was just telling Priya that I too want to make ice creams.Now seeing yours I think I should make one today itself. Delicious.,…Choco icecreams is my latest post too. wow!looks amazing! !am drooling 😛 like the combo of ingredients ….great!!! Fantastic and yummy! 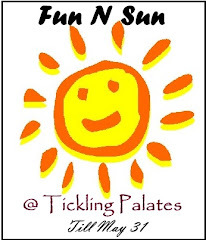 Homemade is always the best…. Deliciousssss..!! 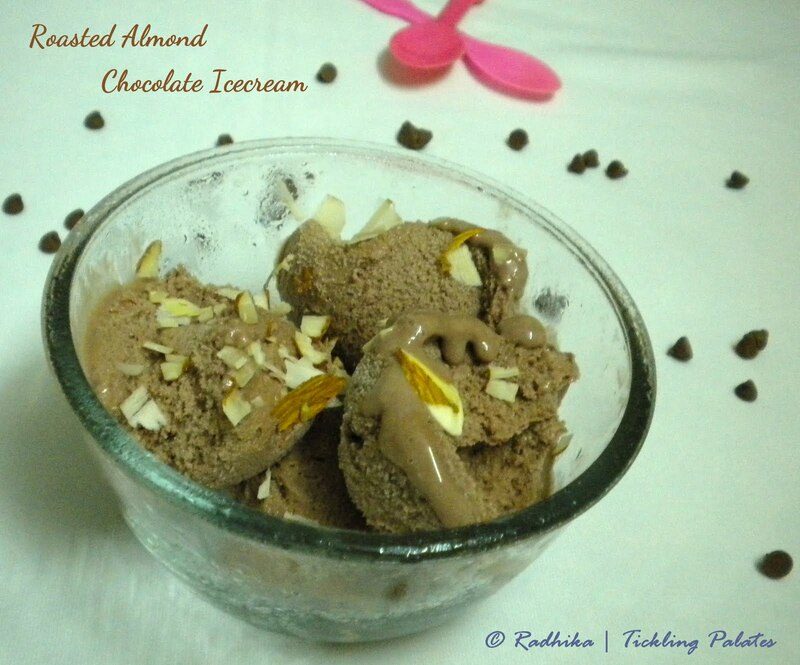 love the chocolate n almond combo. Wow! Looks really good! 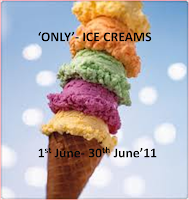 I have not met anyone who does not like ice cream YET! Definitely a winner, chocolate ice-cream are a house favourite!